Innovation thrives when students are engaged, and students are most engaged when they’re immersed in their passion to learn. To that end, students in SIU’s automotive technology program are engaged in gaining valuable experience that will enhance their contributions to the industry. “We’re known for the quality of the students we produce,” program chair Mike Behrmann says. With one of just 12 automotive technology baccalaureate degree programs in the country – and the only one at a major research institution – SIU helps graduates become uniquely prepared for their profession. Of the more than 280 students in SIU’s program, about 90 percent serve paid internships, and just under 90 percent will accept a job offer before graduation. The other 10 percent are likely weighing multiple options. “We cannot produce enough graduates for the industry,” Behrmann says. This incredible real-world preparation comes at a substantial investment from both the program and its students. For example, the toolboxes that line the corridors of the automotive technology workspaces inside the Transportation Education Center cost each student between $1,500 and $2,000, including the tools inside them. Students put these tools to work right away on vehicles, engines, parts, service and safety equipment, and more. Similarly, training successful graduates requires access to university-supplied vehicles, including hybrid, electric and diesel vehicles. Students need to spend time working with a plethora of components in each vehicle, including – but not limited to – battery packs, engines, transmissions and drivetrains, as well as electrical systems. 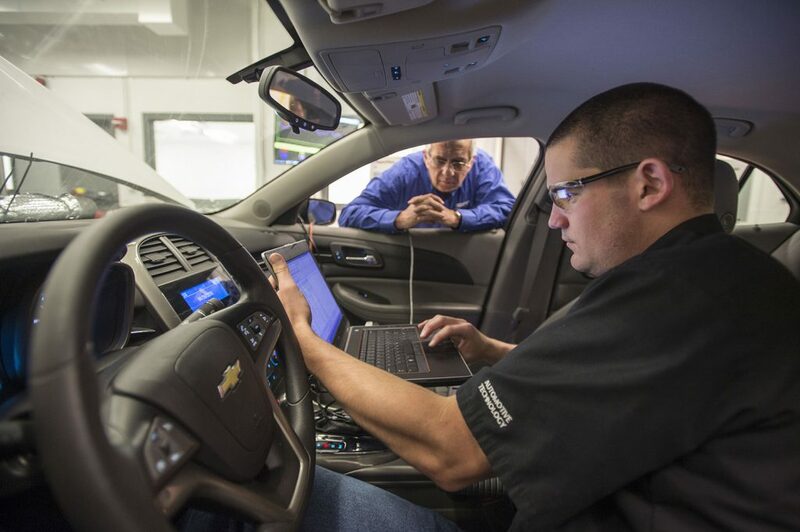 Students also spend time working with testing equipment, such as diagnostic software and emissions-testing tools. Service equipment also is necessary to the learning mission. The equipment includes shop presses, engine hoists, heavy-duty workbenches, impact wrenches and sockets, exhaust ventilation fans and more. The program’s continued success will rely on investments in, or donations of, the tools and equipment that will give students hands-on experience. To learn more about the automotive technology program, visit automotive.siu.edu. To learn more about the needs of the College of Applied Sciences and Arts, visit http://foreversiu.org/colleges-units/applied-sciences-and-arts.php.